of being a u 1. An agent or substance that initiates, precipitates or accelerates the rate of a reaction without being consumed in the process. u 2. Someone or something that causes an important event to happen. 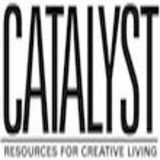 CATALYST is an independent monthly journal and resource guide for the Wasatch Front providing information and ideas to expand your network of connections regarding physical, mental, emotional and spiritual wellbeing. CATALYST presents useful information in several ways: through articles, display advertising, the Community Resource Directory, and featured Events. Display ads are easily located through the Advertising Directory, found in every issue. CATALYST! tions are slow to arrive and hard to trace if they go astray. Notify us promptly if your address changes. The opinions expressed by the authors are not necessarily (though probably) those of the publisher. Call for reprint permission. Copyright 2013, New Moon Press, Inc. 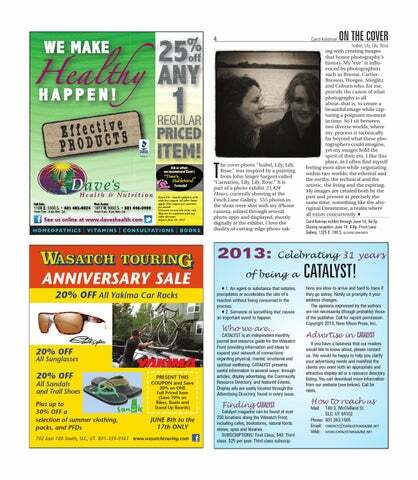 Advertise in CATALYST If you have a business that our readers would like to know about, please contact us. We would be happy to help you clarify your advertising needs and manifest the clients you want with an appropriate and attractive display ad or a resource directory listing. You can download more information from our website (see below). Call for rates.